Reduce elopement risks while supporting caregiver workflow with our Wandering Management Solution. 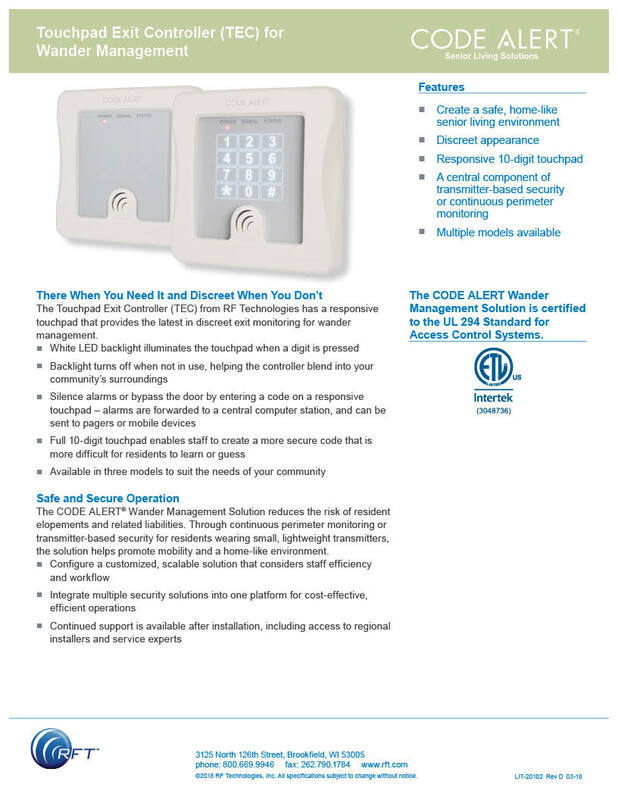 The CodeWatch® Transmitter is a small, lightweight device, worn on a resident's wrist, that can be used with all Code Alert® Wandering Management Solutions. The dangers of resident elopements are extensive, including injury and liability. Manage these risks and support caregiver workflow with our UL 294 compliant CODE ALERT Wander Management solution. Code Alert® allows Adult Day Centers to maintain an open friendly environment while monitoring the clients who are at risk of wandering or eloping from your establishment while under your care. The client wears a discreet watch like transmitter that signals your staff when the monitored door has been opened. A system can be configured to lock the door as well. We have expertise in tailoring a system to meet your individual needs. Allows staff and family to move throughout the center freely. Simple and easy-to use keypad at the exit. No computer or software needed. Designed to meet the budgets of Adult Day Services. Certified installers allowing for smooth set-up.